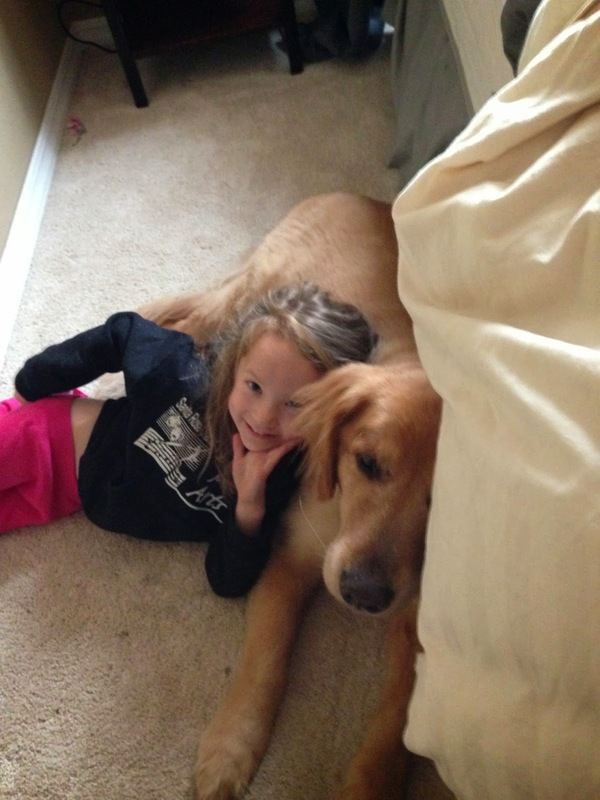 We have created this blog to keep our friends and families updated on Lilly's progress! In February Lilly will undergo her next transformation and we want you to be on this journey with us! Many of you have been part of the "Lilly Connection" from the time she was born and we thank you endlessly for your thoughtfulness and love! Check in often as we will be posting and updating this blog every couple of days through January and beyond. I can hardly believe it but its been almost 5 months since Lilly's surgery! 5 months and an entirely new life has begun for both of us. Last time we all spoke Lilly was just getting started and hadn't even seen her new legs, let alone walked. We were still struggling quite a bit with the life changing adjustments that came with our choice to amputate. I still have flash backs to those early days and am so thankful we are done with that part of the journey. It was not easy or fun but wow, Lilly's new life is pretty phenomenal now and both of us are so thankful that we made this choice. The new energy that Lilly is experiencing is remarkable as well. It's hard to say if its physical or emotional energy, probably both. She is just so happy and excited about EVERYTHING! The simple daily tasks like washing her hands, getting a glass of water and just being up right has changed her attitude dramatically. A popular question right now is, how did I return to work so soon. Lilly and I have been very fortunate to live near family and have established very close relationships with people in our community that all have chipped in, lended a hand and shoulder whenever we needed it. I pulled from a lot of those that we loved for help. It was mandatory that I return to work for financial reasons and well as insurance reasons and simply for my sanity. So whats happened in the past couple of months? One of Lillys acheivements over the past 5 months is that she graduated Kindergarden and had the wonderful first experience of "walking" to her Teacher to get her diploma! 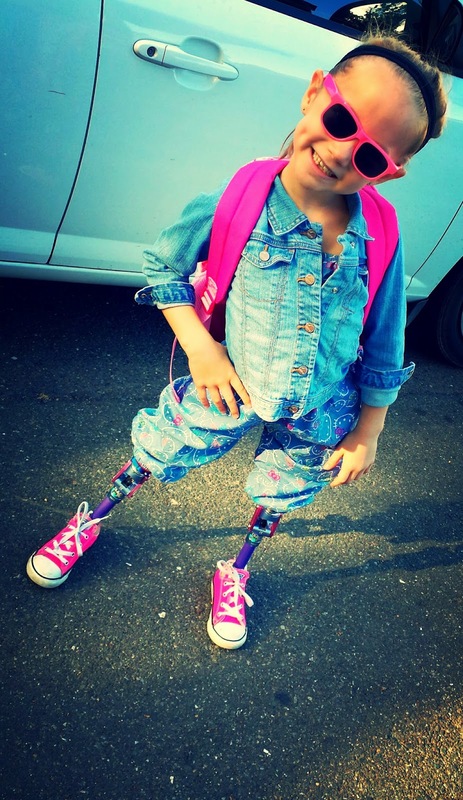 Lilly got her first set of prosthetics from Hanger. Bill Shea is her prosthetician and is an amazing person who has had to spent a lot of time tweaking and adjusting her new legs. He has also educated both of us on how it all works! Bill has become one of our favorite advocates and mentors. He is also amazingly good natured about the importance of pedicures and pretty shoes! Bill often reminds me to slow down and remember that Lilly has never walked before so she has no point of reference. 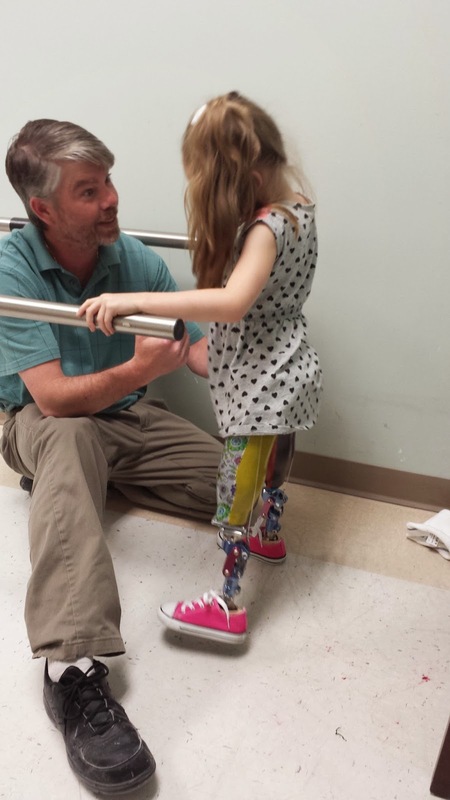 Its hard to imagine, but for Lilly, each day is a mobility test and challenge. In the process of Lilly learning to walk a wonderful non-profit organization came into our lives. Santa Tim is the organization and it was the man and his organization who sponsored Lilly and I to go to Camp No Limits 2014. 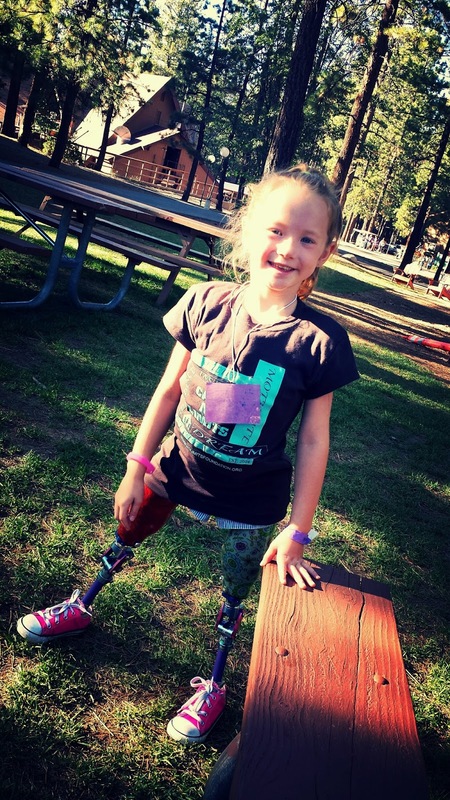 Camp No Limits is a camp for children and families who live with limb loss. Oh my goodness, it was fabulous fabulous fabulous! Lilly and I met so many new friends and I was able to network with other families and organizations. I think the highlight was when Lilly got to try running legs. The look on her face was one that I will never forget. It was as if the reality of her new life had just hit a new high point and she was in love, totally in love with the running legs and all the possibilities that they held for her. From that day forward she aspires to participate in the Paralympics as a long distance runner. Can you imagine - just 5 months ago she had never even stood up and she is dreaming of the Paralympics, wow how amazing life is for Lilly and I now. I find myself speechless. 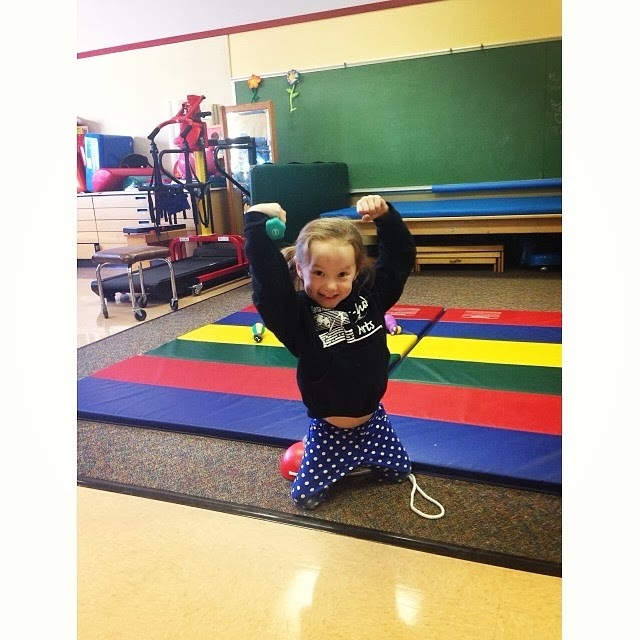 She also continues with weekly physical therapy, participates in gymnastics camp, swimming and T-ball. So has Lilly had any PTSD symptoms or phantom pain? In the beginning, right after surgery for the first month or 2, yes. She was terrified almost "frozen", she was very angry and blaming of everyone for the loss of her legs. About 5 times she mentioned that her toes tingled or hurt. We were very lucky, all of these symptoms faded away as time past and she does not complain about any pain or loss today. However, the other day she and I were having a casual conversation and she talked to me about things that she remembered from surgery and those early days and then quickly moved on to how happy she is to have her new legs and how she can do "everything" now. rejoicing over every moment of every day? Well that's sort of the way we are feeling now! I feel like I have been unable to adequately describe what this journey has really been like but today, finally, both Lilly and I feel free again! She is healthy, sweet and smart, sassy and ever challenging. Just like she should be, just like she always has been and I can breathe again. The past month has brought so much to us, from venturing out again to jumping in the deep end again, literally. Although it took along time, Lilly eventually got a bit of confidence back and was willing to go watch a friends baseball game. Everyone was there, school friends and my friends. She was very timid at first but soon realized that her friends just wanted to be her friends and they liked Lilly the same with or without her legs. Within an hour or so, she was happy and starting to venture out beyond by arms. It has been a lot more emotional and mental that I thought it was going to be, not that the physical part wasn't hard enough! For a long time she has not been open to anyone seeing her legs, or what is left, which is her thigh, I just hate the term stump so I'm going to refer to them as her legs until I come up with a better term! She wanted pants that were full length and covered her like a blanket. However, every day she gets a bit braver and will roll them up or wear shorts. Sounds crazy I'm sure but this is a big deal to a little girl! This 2nd month we have really moved forward in Lilly's journey. One big step was when Lilly asked to go swimming again. This is something she has always loved and it was very sad when she wouldn't even get into a bath tub let alone a swimming pool. But one step at a time, one tiny accomplishment at a time, she is moving forward. She went from not being able to submerge herself in the tub without complete hysteria to wanting to go into a swimming pool pretty quickly. It was mostly about her trusting herself again and letting go of her fear. She said that she was sure that her legs were going to fall off or melt away. Can you only imagine what was going on in that little mind. God love her, she is amazingly strong and determined and I'm so proud of her. So off to the doctors office we go! 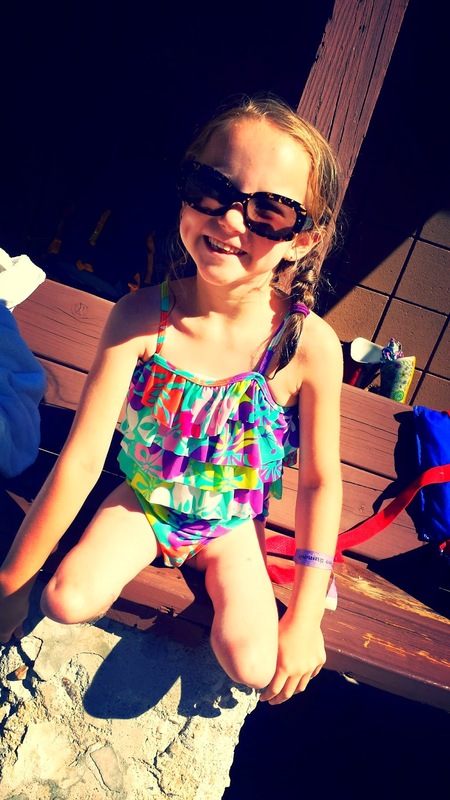 We needed to have approval of both her pediatrician and her surgeon before we could go swimming again. . . or any other sport! 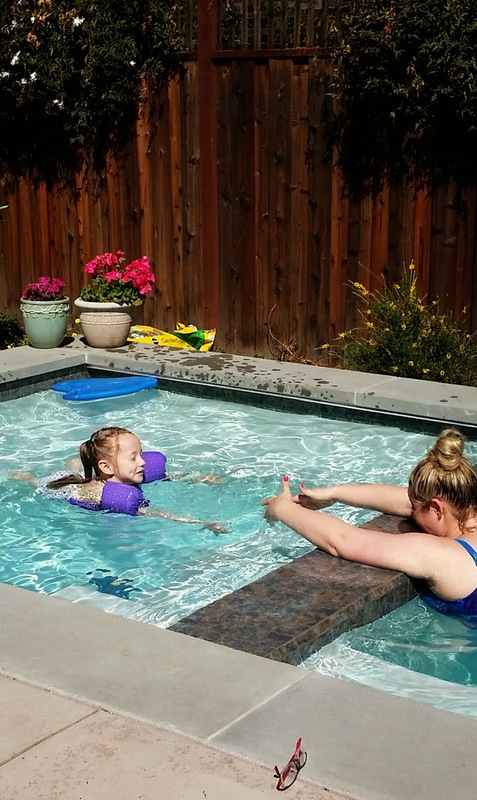 Lilly's first day back in the pool was everything I had hoped it would be for her. She was relaxed and happy, trusted herself and enjoyed it! That's what was most important to me. I just wanted her to have fun and relax. She doesn't need to be an Olympic athlete but I hope that she will trust herself and always try whatever she is interest in. and my answer was YES YES YES. 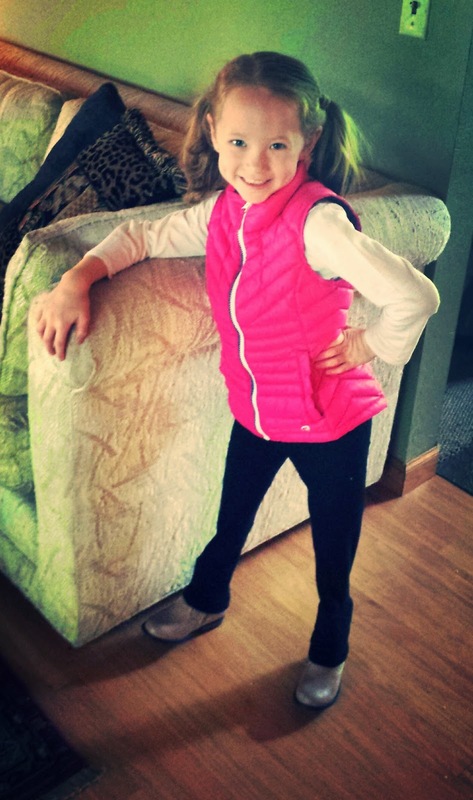 I want Lilly to try everything she is interested in, so here she is, ready for her first day at gymnastics. She was so excited and had so much fun. All of the girls were so nice and friendly to her. We have been very lucky to always have so many positive and supportive people around us! Needless to say, now we are enrolled in swim lessons once a week and gymnastics once a week! 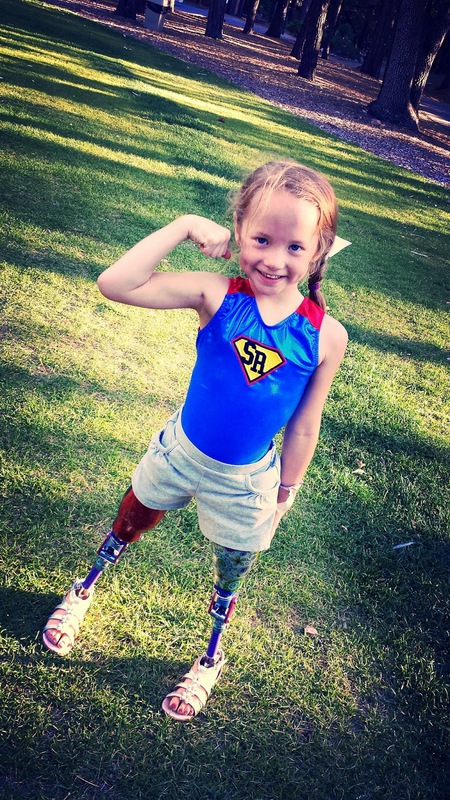 Well, she has been fitted for her first set of prosthetics and will begin a rehabilitation program specifically for amputees within the next 3 weeks. The program will also include a support group for myself and Lilly will have her own support group too. It is vitally important that she learn how to walk correctly from the very first step she takes, but it is also important that she learns how to deal with her life mentally and emotionally in a healthy way. I feel really confident that our team of professionals is the right fit for Lilly and I and she is going to do amazing things! It is an extremely exciting and fascinating time in our lives and we feel so honored to be sharing it with all of you. Your gentle words, endless random acts of kindness, prayers and dedication will never go unnoticed or unappreciated. Thank you! Thank you! Thank you! I can hardly believe that today is the 1 month mark for Lilly! Some days it feels like its been 1 year! I have to say, its been way harder than I was ready for! I wish that I could spend my time with all of you expressing how great and easily we have adjusted and that it was no big deal, reality is, its been extremely difficult and it was only until today that I could even sit down and write about it. Sorry if my thoughts are all over the place but you'll get the picture! The surgery itself went just fine. Medically she did great and we came home ready to conquer the world. Unfortunately, things did not go quite like that. Once all of the medication wore off and she became more clearly aware of what she had been through, she fell apart. 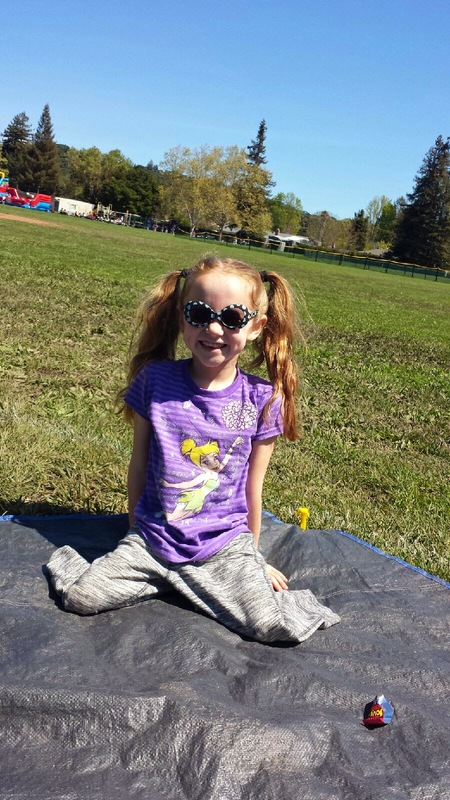 Although we had spent a lot of time trying to prepare Lilly for what she would be facing after surgery, she didn't realize that she was not going to just wake up in the hospital with new legs. She had no idea that this was a longer process than just the hospital stay. I too was struggling with my own feelings of guilt for not making this situation more clear for her, but the truth is, I really didn't realize that this journey had so many more levels that just the obvious physical ones. Emotionally it has taken a greater toll on both of us than I was prepared for and spiritually I was not ready to question my choices. Very soon she become mad, not kind of, but really mad! Lilly spent most of the first 2 weeks crying. She cried because of the pain that she thought she was going to feel but was being masked by fear and the occasional oxycodone, she cried because she was scared of what was there, and what was not there, she cried because she was mentally missing the legs that were gone. Many times she told me that she worried about the "little legs that didn't listen to her". She cried because she could feel something poking her toes that were no longer there. And when she wasn't crying, I was! Lesson #1 - I have learned during this process that there are some things you just cant completely prepare yourself or your child for, this is one of those times! Do the very best you can and stay calm. Breathe in - breathe out, breathe in- breathe out. And while all this was going on - at 8am Monday thru Friday the Homeschool teacher was at my doorstep ready to spend 1 hour with Lilly going over lessons and doing homework. The beginning of week 3 ~ Lilly is going back to school and I had to return to work. 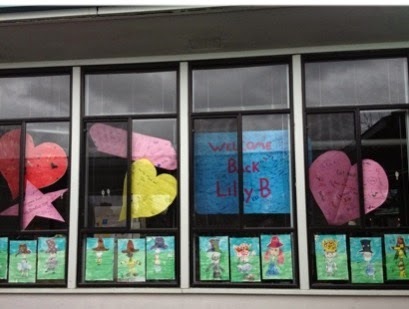 Thank God for Lilly's teacher who not only prepared the kids for Lilly's return but even decorated the class for her return! Mrs. Finley has done everything humanly possible for Lillys transition back to school to be smooth and welcoming. She even set up a resting area for Lilly if she gets tired with a sleeping bag and yoga mat! The distraction of her classmates and school was very helpful, and everyone has been so supportive and kind! We returned to Shriners on March 3rd to have the stitches removed. It was planned to happen in their outpatient clinic and should not have taken more than 20 or so minutes. Didn't happen! We had to return 10 days later when they could sedate her. She was hysterical about anyone touching or looking at her legs and the doctors felt that traumatizing her again was not necessary. A little "happy juice" however, and she was OK, stitches out! In the meanwhile, all around us, friends and family were coming by, delivering dinners, bringing Lilly gifts and cards, stopping to visit with us and trying to hold us up! Thank God for all of you. I truly know how hard it is to stop in your busy lives and give again, but you all did, and we are eternally grateful! By week 3 I started to see the true Lilly returning! However, talking about her legs or even thinking about them made her cry again. She thought that they were scary, which broke my heart but all along we tried to talk about them anyway. It was my hope that by talking, it would desensitize the trauma that she was experiencing and we could eventually move onto the next step in the journey. Well, it has worked S L O W L Y, very very S L O W L Y. Time is a funny thing, when you want it to go fast it is ridiculously slow and when you want it all to slow down, it races by. Lesson #2 - Be patient, things will happen in their own time. You are not the boss! Today Lilly is just beginning to try her new legs out. She will stand on them but for only a moment. Her new fun trick is "planking", for those of you who don't know what that is, here is a picture of Lilly planking, in my book planking is totally physically impossible but Lilly thinks they are great fun! Next week she begins wearing compression socks that will help with circulation. We have been told that they will also make Lilly feel more secure and held together. Each day, Lilly is doing better, but I must admit, it has been agonizingly slow. 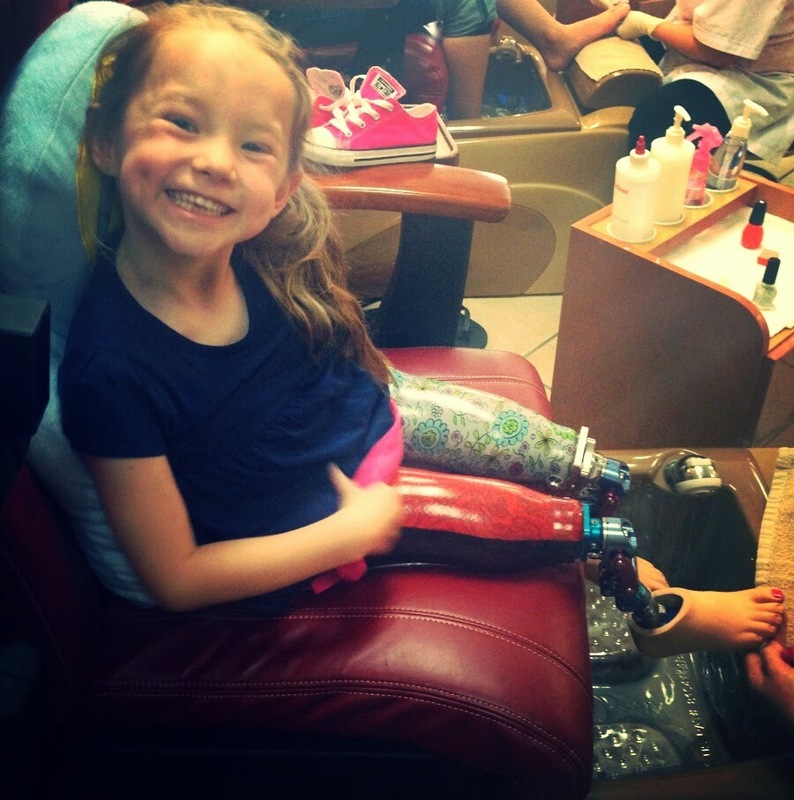 April 11th she will have her first experience with prosthetics! Wow 5 days have gone by since Lilly's surgery. I can hardly believe it! But before I talk about anything else I want to say that she is doing great! The surgery was successful and physically and mentally she is adjusting perfectly. I think that one of the thing that has affected us the most is how our community and family have come together to support us. Lilly and I live a relatively quiet life and I have never "put us out there" to be criticized or judged before now, so to be greeted with open arms from our community and extended family has been as life changing as her surgery has been. OK so now, what happened ~ On Thursday at about 7:30am we changed the original plan from having a spinal block to using an epidural. Why? Because a spinal block would have only lasted about 8 hours and the epidural could be left in place for pain management for up to 2 days. Lilly has a history to difficulty with pain and coming out of an anesthesia so we chose the epidural. Her surgery took about 4 1/2 hours. Can I tell you that 4 1/2 hour of your daughter being in surgery stands for about 4 1/2 years in mom time! At any rate, we were graciously greeted by her surgeon afterwards who told us that "she was money" which I loved! Such a great use of the phrase! He went on to say that the surgery had gone exactly as he had expected and that she would be in the ICU for 2 days. 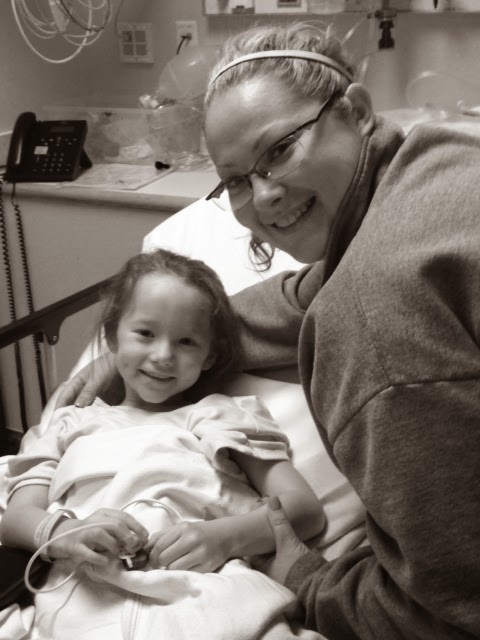 She had drain tubes in both legs and due to the epidural, she had a catheter and IV lines in both arms for additional medications. The first 24 hours were rough. Lilly woke up thrashing around, pulled the tubes out of her legs and then because they were pushing meds so fast into her tiny veins, she blew the IV out too! Our nurses were amazing and are truly angels here on earth. They amazed me time and time again with their endless compassion and ability to see through a comment or situation and into what we really meant or needed at that moment. Every single time Lilly said that she wanted something to eat or drink, that exact thing would magically appear at her bedside, from quesadillas to chicken strips, specific movies to toys; it was awesome! The level of care we received from Shriners what truly life changing and I only wish I could explain it to all of you. Everything from the knees down is gone now. We were all very concerned about how she might react when she was clear enough to realize this. A lot of time had been spent talking and preparing her for it but . . . she's 6 and she might not have understood the reality of what she was going to have to face. We were all concerned that we might react wrong too, but the truth is, Lilly looked at her legs and she was happy. She was proud. She seemed relieved. She wanted to show them to all of us. It was a truly enlightening moment that I will never forget. "Touch 'em" she would say, they are light now! She immediately started lifting them and moving them up and down. OMG, she gets it! She understood all the work we did to prepare her! She's not mad, she isn't blaming any of us, she is happy. Most of day 2 Lilly slept so I was nominated to hand out Valentines to the staff. Little did I know that today would be monumental for us too. First we were greeted by the Queen of Hearts! Truly ~ we were greeted by about 10 women in tiara's representing the Queen of Hearts for Valentines Day! Part of the magic of Shriners is that they are able to mix the old and young along with touches of whimsy and play to create this place of healing and love without making it intrusive. It was a much needed break from all of the seriousness and worry too. So after being kissed by the Queen, I was sitting in the clinic waiting to hand out Lilly's Valentines when I realized that all the kids in the room had prosthetics. This was Lilly's future. I could see her here, walking, playing with the other kids. My heart was filled with hope and joy for her and her future. At that moment I knew she would be OK, we would all be OK.
We are getting out of the ICU! Don't get me wrong, the care was outstanding but so was the boredom once she starting feeling stronger! So with the epidural out, catheter out and IV lines unattached, downstairs we go! Again, fabulous nurses and staff! Lilly decided at that point that her wheelchair was her best bet for freedom so around and around we go, down every hallway in the place. Lilly has virtually no pain at this point and is only receiving 1/4 tab of Oxycodon every 4 hours. Seems unbelievable but after only 4 days we are on our way home today. Lilly and my life has changed forever and I don't think that we could have done it without you. In the past 4 days alone we have received hundreds of phone calls, cards, texts and face to face moments with all of you and some complete strangers. You have touch our lives forever, we needed you and you were there for us! Well the pre-op is behind us! We met with this lovely lady at Shriners who was called a Child Life Specialist. She met with all of us but concentrated on just Lilly. They talked to us about what Lilly would see in the first operating room, what kind of stuff they would put on her body including monitors, oxygen strips, a stethoscope, a syringe for medicine and band-aids. She gave Lilly a Cabbage patch doll who had had a double amputation too! She also showed us a doll that had her prosthetics on and Lilly was able to take it all apart and check it out. We met with the surgeon and went over all of our questions and then had new x-rays done to re-confirm that Lilly's back (scoliosis) was OK. This was very stressful because if her back had a 38 to 40 degree curve the surgery would be questionable. Thankfully, her back is at a 19 degree curve and we are ready to go! During our 4 hours pre-op we did however have time to "smell the roses" and enjoy all of the beautiful artwork that the kids had done for Valentines Day! Oh, and playing with Auntie Meagan is always a great stress reliever! So I think that we are as prepared as we can be. Lilly is ready and I think she just wants it all to be over with! I feel like I am ready to shatter into a million pieces but everyone has been so helpful and supportive I know that I will be OK too. I have endless faith in our Shriners doctors and staff and I look forward to the next part of our journey! Next time we talk will be on the surgery day so . . .HERE WE GO! 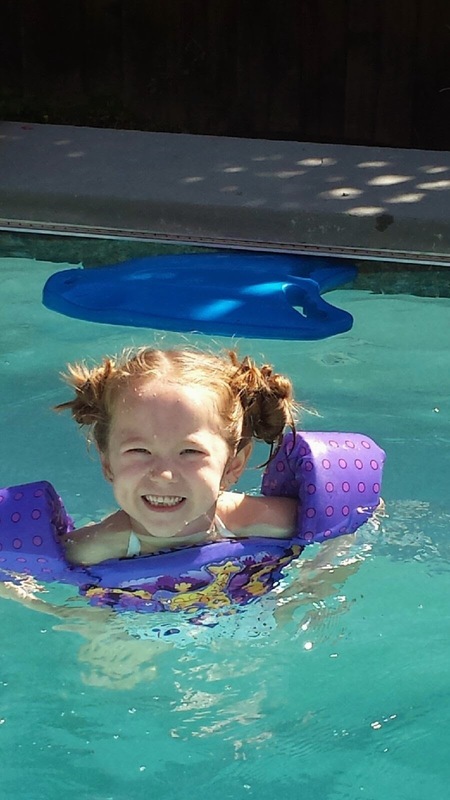 This is the story of a little girl who was born with Arthrogryposis Multiplex Congenita - WHAT!! Lilly was born in 2007 in a hospital not prepared for her by a mother who didn't know she was complicated! Twisted and contorted Lilly came screaming into my life. No one had ever seen a baby like her and she was quickly taken to UCSF. "She will never swallow, she is blind, she is deaf, she will never move, she is cognitively impaired and she may die within the next 24 hours!" This was my first conversation after awakening from the c-section. It was crazy and overwhelming! As her mother, those were not questions that I even could consider. 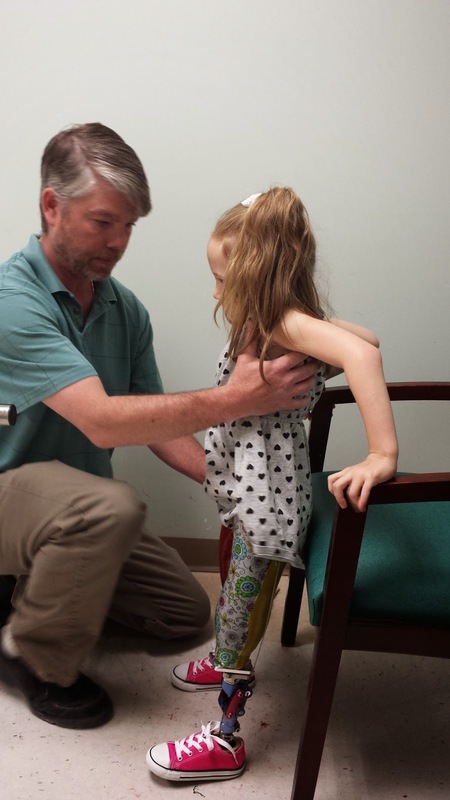 Arthrogryposis multiplex congenita (AMC) is a group of nonprogressive conditions that cause multiple joint contractures (stiff joints) and abnormal muscle development. The signs and symptoms of AMC are present at birth but can vary greatly in severity. The exact cause of AMC is not fully understood, but it is thought to be associated with decreased movement or limited space in utero, connective tissue disorders, or maternal illness. Additionally she was diagnosed with scoliosis, kyphosis and torticollis. In Lilly's case, she was affected from the mid thigh down. She did not have knee caps and most of the bones in her feet were missing or in the wrong place. Her muscles were very tight and she could not bend . . at all! Her legs looked like they were on backwards, and the banding was isolated only to her lower extremities. It is not unusual for people with this condition to have all joints affected, including the jaw, back, elbows and shoulders. However, AMC does not affect a person cognitively. People with AMC usually have average to above average I.Q.'s. So before Lilly even turned 1 month old she was in casts. Her first set of casts were to stretch her Achilles tendon. At birth her feet were at a severe point. So severe that the cast used to slip right off! Shriners Childrens Hospital Northern California. Let me just say, Shriners Sacramento has been a blessing beyond words. Believe me, if I spend the rest of my life talking about how awesome they are, it wouldn't be enough! They were like family from the moment we walked in their door and remain this way to us today. Treatment options consisted of countless castings, physical therapy and occupational therapy, speech therapy and the occasional surgery to cut her Achilles tendons and reposition her legs. More than any of those things, it was about constantly reminding myself that I was blessed to have her and that together with family and friends we would figure it out and make Lilly's life as normal as we could. 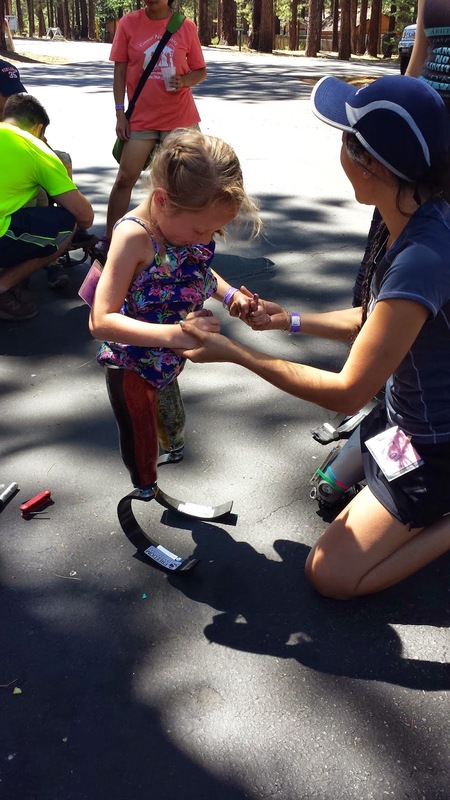 Our journey back and forth from Northern California to Sacramento was only possible because we used a specialized "lie down seat"supplied by Shriners for her to be transported in. Because she couldn't bend, a standard car seat was useless. First Achilles tendon surgery done at Shriners. Now her feet had an angle and casts could stay on! But she still couldn't sit! Her biggest surgery came when she was 15 months old. Shriners surgeons would break both legs, reposition them to a forward position so that she could sit, put in plates and pins and cast her from the waist down. She was in a body cast for 2 months. Amazing what we all take for granted . . but seeing Lilly able to sit was life changing! because Lilly could sit we were able to potty train her. Believe me, it was a big deal! She wasn't that happy but I sure was! The surgery was considered to be a success but the prognosis was the same, Lilly would never walk. Between 2 and 3 years old Lilly was just Lilly and did little kid stuff. Except she wore AFO's and a back brace! Amazing what you can do in those things! She wore her AFO's (ankle, foot orthotics) 12-14 hours a day and her back brace ideally 8-10 hours a day while she slept but usually it was more like 4 hours a day. She was not very fond of the back brace. After a while the screws and plants started to bother Lilly and were thinning the skin around the incision site. We had to wait a while until the newly positioned bones got strong enough to hold without the assistance of the screws and plates. She has physical therapy and occupational therapy twice a week too. I think she actually likes all the physical/occupational therapy! In 2010 Lilly got her wheelchair! This was HUGE and Lilly immediately became "one" with her new freedom machine. I have to say, it was hard, very very hard to accept that Lilly was never going to walk. I spent countless hours crying for her and for me. Why? What did I do? What didn't I do? It cant be real. I cant do this! But the bottom line is, Lilly is healthy and happy, she just cant walk. I know, I know, easy to say now, and easier yet to say when she is not your child. Truth is, there are situation much more difficult and tragic than Lilly's, and we will survive and thrive, no matter what! And that is the attitude I have to have to get through!! I have always thought it was important for her to be mainstreamed in school so she attending a regular preschool and learned her ABC's and 123's. She was their first student in a wheelchair. Baseball Summer camp, swimming at the YMCA and golfing with Papa. Finding different ways to be more mobile is a hurdle that we work on constantly. Getting a service dog was something we seriously considered and applied for but while waiting we were blessed with Rusty. He has been the best gift in the world for Lilly and I. He came to us from a family friend who had raised him to be the most gentle, sweet tempered animal I have ever seen. 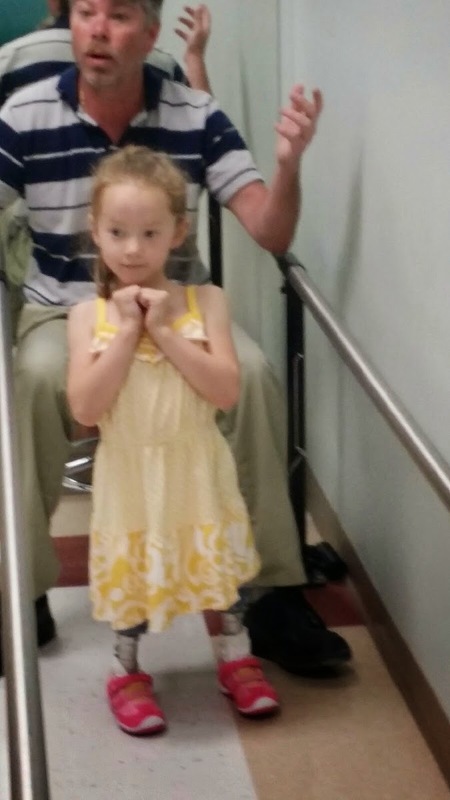 He circles Lilly when she is out of her wheelchair to make sure she doesn't fall. He lays with her and she talks and talks to him. 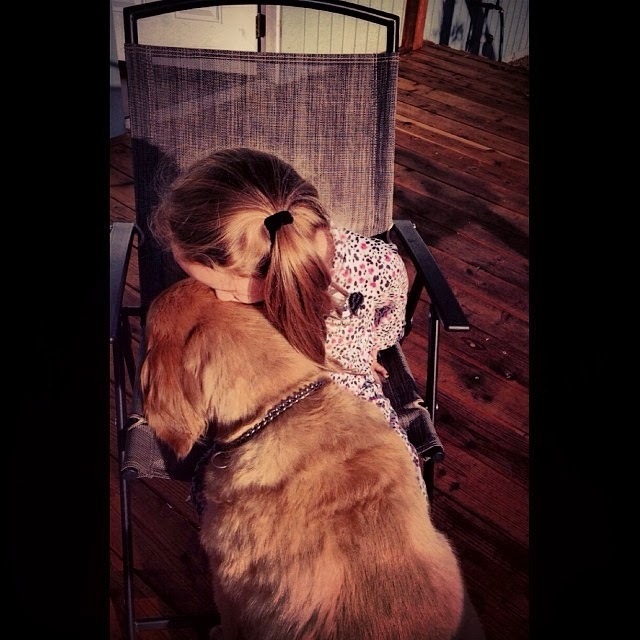 It is the sweetest relationship and we are so grateful to have him. No matter what Lilly has always maintained a "nothing will stop me" attitude. But without Lilly's amazing and unconditionally supportive team of specialist like the people at CCS none of this new equipment would be available. This year has been filled with changes! Lilly started a new school and had to face not only being the new kid, but the new kid in a wheelchair. So far, so GREAT! Lilly loves school and has a ton of friends! They asked a lot of questions in the beginning but once they had an answer they have been wonderful and accepting and very helpful. I also feel very thankful to all of the Mom's who have been so sweet and supportive of us. Mrs. Finley is her teacher, and has been voted best teacher in the world by Lilly and me. She has been open and accepting, loving and concerned, she has made difficult situations much easier and we are eternally grateful to her. Enough can't be said for an amazing teacher. Lilly's growth this year academically and socially has been tremendous and I credit that to the wonderful school she attends and the fabulous staff and teacher she and I have been blessed with. Lilly is 6. She is happy and funny, sweet and temperamental, loving and mysterious! Every time I think I know what she's going to say, out comes something profound and beyond her years. Physically, Lilly was doing just fine, developing her own way of dealing with the environment she is in and developing her own way of "walking" while out of her wheelchair. I didn't think anything of it. I thought that was what people with challenges just did . . .they developed their own way of transporting themselves without their equipment. Lilly's method of "walking" was on her knee's with her legs tucked up behind her. Over time this became her preference over being in her wheelchair. So at home and in safe places where she wouldn't get run over, she walked on her knees. In September of 2014 we went to Shriners for a normal 6 month check up. Things have been going just fine. We were sure that this was just going to be a quick "how are you" type of appointment. Her surgeon and physician assistant have been with us for 4 1/2 years and we love seeing them and catching up, so no biggie right? Well that whole "walking on her knees" thing was a new development that they found very interesting and we were quickly taken in to have new x-rays done. OK wait a minute, what's going on? 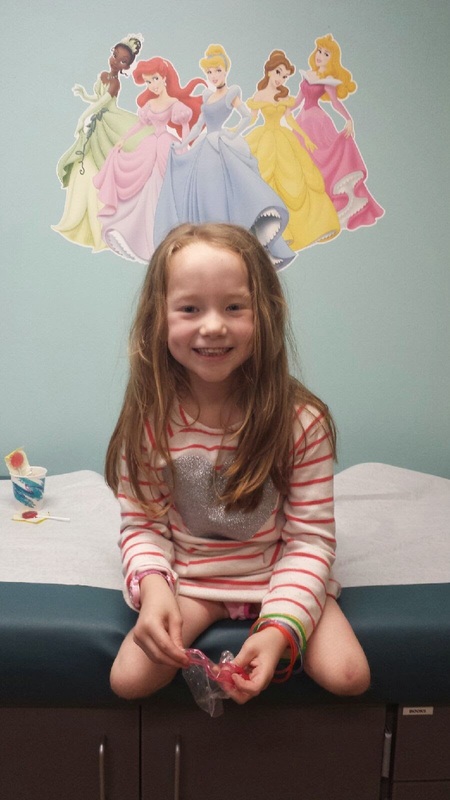 Well, turned out that Lilly's scoliosis, torticollis and kyphosis had become "functional". But most importantly she proved that her muscular/skeletal system could bear it own weight. By developing her own funny little way of walking on her knees she proved that she could hold herself up and that her legs rotated in the hip sockets correctly. OMG this whole time none of us realized that what she was doing was getting herself ready to walk, really walk. I'll never forget when the doctor said, we were just waiting for Lilly to show us what she could do"! Lilly's response was, "I want to walk". But in order to achieve that she would have to have both legs amputated at the knee. We went in and met with the prosthetician that very same day. Wow, you want to talk about choices! Try making that choice for your 6 year old daughter. It was a long ride home that day. Long and very quiet. Our world (weird as it was) had just taken an enormously different and new direction. Don't misunderstand me, I have been making impossible decisions for her from the time she was born and I will continue to until she is old enough to make them for herself but really. . . 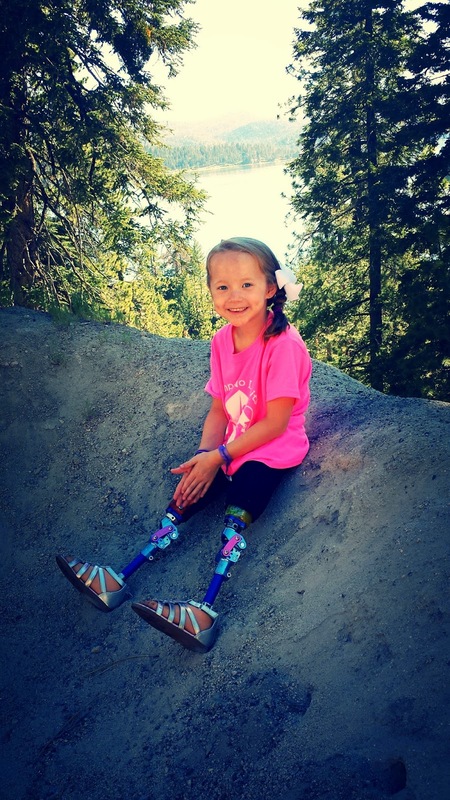 Conversations about amputation have been circling in Lilly's world from the day she was born. Literally. Its not a subject you toss around lightly or have with just anyone. Only a very few have been in on those conversations with us. But as the past 6 years have passed and we have watched her, and the professionals on allllllll levels have watched her. We all knew that the decision to amputate was the right one for Lilly. For Lilly it means greater independence, more mobility, better health and quality of life. It seems crazy as I look back over the past several years. We have put in endless hours of PT/OT, doctors visits, tests, you name it, Lilly has had it done. And it all has led us to this point. A place I wasn't ready to consider until now. And what does Lilly think? Lilly's feet hurt more often, they are cold most of the time and she is well aware that they don't work. She knows that she is facing a serious surgery and big changes but she is very pragmatic about it all. She has asked where her legs will go when the doctors take them and will they grow back. 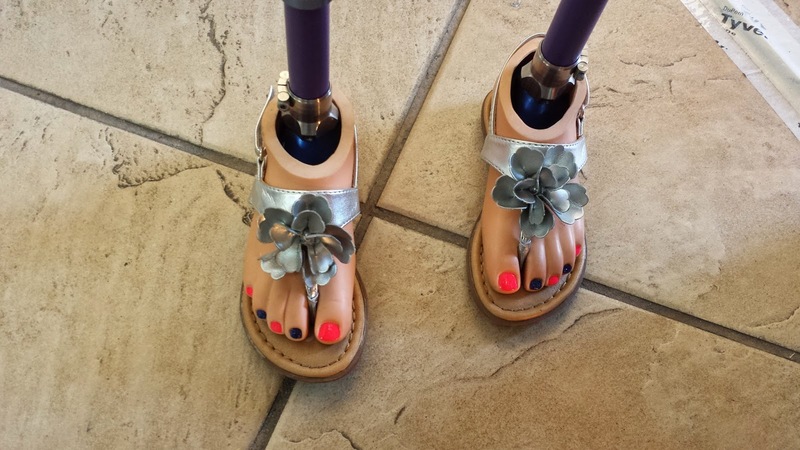 Will her new legs have toes that she can paint - and can she walk! We talk about it every day and with each question comes more realization that life if about to change again, for the better! Strange funny little things have helped put it into perspective for her, like I took the bottom part of a Barbie doll leg off her doll and showed her how it would look. 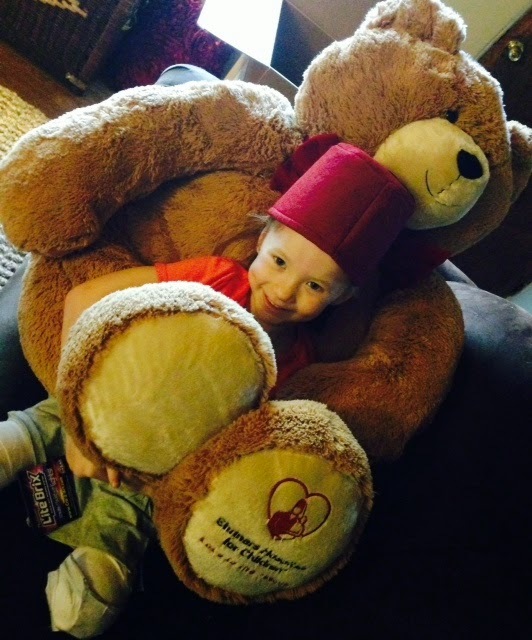 Shriners gave her a teddy bear who had had an amputation, we read books on amputation and have talked to a child psychologist, all in preparation. I think what has help the most it that Lilly knows that regardless of what we do, she is fabulous. She is smart, witty and strong willed. Regardless of what her legs are, can or can not do, she is going to be just fine and she is loved without limits! Castings for her "shorties" were done that day too. Lilly's first steps independently with her shorties! Lilly has been in her shorties now for 3 months. She is walking in them every day, all day and she is crazy fast in them. She actually got away from me in the toy store today! Her surgery is scheduled for February 13th. Wow, we are 2 weeks from Lilly's surgery and things are starting to move fast! The questions that I have been putting off are suddenly unavoidable. Her pre-op is on Monday 2/3 when we will meet with the surgeon, prosthetician, surgeons assistant and the psychologist one last time. I am making endless lists of what we should ask them. I think that there are 6 or 7 tablets roaming around the house with one or two questions on each one just because I am finding it harder and harder to focus. Should we go to Sacramento the night before? Do I have all of the phone numbers I need, insurance cards, money and strength I need? Strength - ? Sometimes I think we are surprisingly calm, other times ~ not so much! How will the anesthesia go? Spinal block? General? How long is she under anesthesia? How long before I can see her again? Will she be OK????? Lilly historically wakes up really mad so . . . that should be interesting! Will we be there 2 days, 4 days? All of these questions have already been answered several times by Shriners but I need to hear them again! And again! How will the Home and Hospital Program work through her school? Who does what, and what forms have and have not been received? Should I arrange for additional tutoring? Will Lilly be up for it? The standard recovery time is 6 weeks but I can believe that Lilly will be out more that 3 or 4. Oh boy, this is stressful stressful stressful! And how is Lilly? Well, being 6 years old is a blessing! Because we will be in the hospital on February 14th, she and I spent last weekend making Valentines. She feels confident that she will be able to get in her wheelchair and hand out valentines to the nurses and staff the day after surgery! I just don't have the heart to tell her that she might not feel like quite up to that but none the less, we have them all packed and ready to go! Otherwise, she is very relaxed and counting down the days, literally. We have a calendar on the refrigerator that she puts a big X on each morning and then she boldly announces how many more day left before we go to Shriners. (Just as another level of anxiety washes over me)! Funny how things that are planned so far in advance suddenly creep right up on you ~ I didn't think the date would ever get here and now here we are just 2 week away. Excited but terrified. Thanks again everyone! Talk to you all very soon!